The Duterte campaign has just issued a statement calling on the supporters of the Davao city mayor and presidential candidate to stop bashing ABS-CBN News anchor Karen Davila on social media. "The Davao City mayor and leading presidential candidate learned yesterday that ABS-CBN anchor and debate moderator, Ms. Karen Davila, was bashed on social media Sunday night and accused of being biased against him," wrote Peter Tiu Laviña, a spokesperson for the Duterte campaign, on his Facebook page. "The mayor takes no offense against Ms. Davila. She was not at all biased." Laviña also called on their supporters to exercise discipline on social media, writing: "From Day 1, we have called on our followers to take the moral high ground and take caution in social media. In behalf of Mayor Duterte, we reiterate such call and appeal to our social media supporters to stop bashing and even threatening journalists as well as all who express views different from ours." He added: "Every journalist worth her or his salt should ask probing and challenging questions. Duterte never got offended during the debate. That's what free speech and democracy is all about as Duterte kept on explaining to us. Let us all exercise discipline but at the same time be vigilant against trolls posing as Duterte supporters and infiltrators out to harm not just Duterte, our movement for ‪#‎TunayNaPagbabago‬ but on the likes of Ms. Davila to generate anger on us. Vigilance is the price of freedom!" 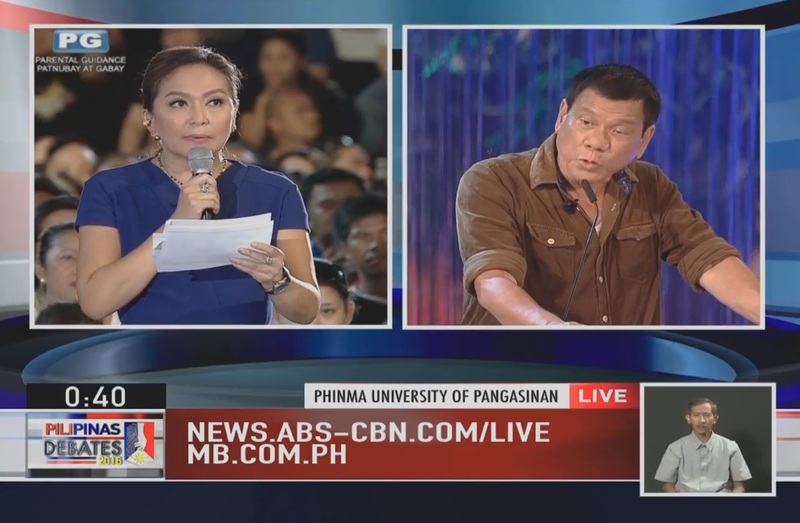 Davila, who served as one of the moderators at Sunday's PiliPinas Debate, has been the target of attacks from some of Duterte's supporters for what they believe was the unfair treatment of the ABS-CBN anchor towards their presidential candidate.